Release date (Live PBS): 3 december 2014. DVD released: 2 june 2015. Date: Recorded live on August 21, 2014. Label: Sony Masterworks' Portrait Records. Angelic Jackie Evancho returns to PBS with her latest collection of songs from her new CD, Awakening. 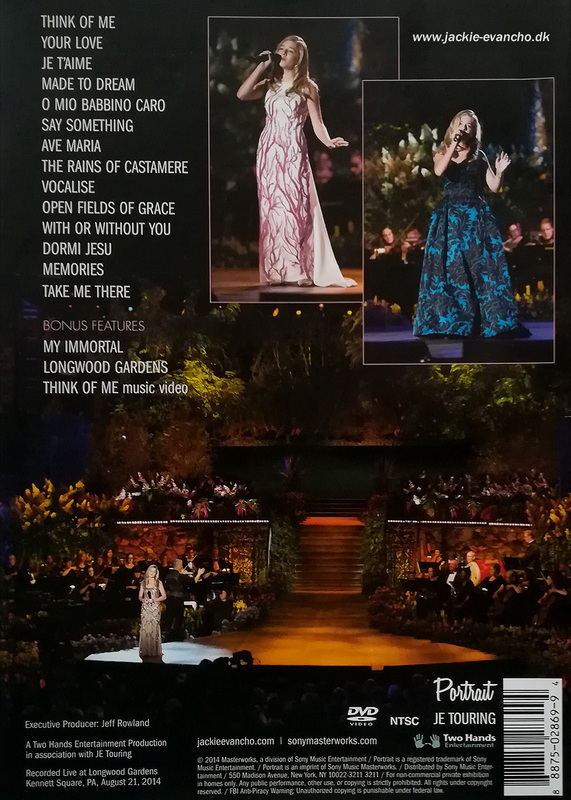 Drawn from the best known pieces from the classical canon, Broadway, uplifting sacred music and pop songs, Jackie's astoundingly beautiful young voice soars again at the magnificent Longwood Gardens Open Air Theatre. Longwood Gardens is over 1,000 acres of gardens, woodlands and meadows in Pennsylvania's Brandywine Creek Valley, Jackie's home state. This is the first time Longwood Gardens has ever permitted a television special to be taped on site and, in addition to her on-stage performance, Jackie will be performing at various stunning locations throughout the Gardens such as the Chimes Tower and the spectacular Main Fountain. Jackie will be joined by Cheyenne Jackson who will both host and perform with Jackie. The two will also show us some of the splendid beauty of the Gardens as they tour some gorgeous key locations within it. Fourteen-year-old vocal sensation Jackie Evancho's new album, 'Awakening', signals some new directions for the platinum-selling artist. Without foregoing the beautiful and lush classical-crossover compositions for which Evancho has became famous, she also extends her stylistic reach with contemporary material on songs such as the haunting folk song 'The Rains of Castamere' from HBO's hit series 'Game of Thrones'. Jackie also takes a bigger step forward on her version of U2's 'With or Without You', and also sings a few original songs including the anthem 'Take Me There' and 'Open Fields of Grace', which were written especially for her. Produced by Nick Patrick, "Awakening" also features the ethereal ballad 'Memories' by the Dutch band 'Within Temptation', and the popular classic 'Think of Me' from Andrew Lloyd Webber's 'Phantom of the Opera'. Rounding out the album are the classical standards 'Ave Maria' and Rachmaninoff's 'Vocalise'. Jackie Evancho said about 'Awakening': I feel that my singing style has matured, and it's easier for me to feel comfortable onstage. Jackie will be filming a new PBS pledge special that will air nationally in December and will be touring throughout the U.S. starting in November 2014. 17 tracks in all, including 3 bonus tracks. You can order this DVD at Amazon or at Imusic (if you live in Scandinavia). Just follow the link above of this page. I need your help, if anyone knows where you can order the Blue-Ray version of 'Awakening - Live in concert', please contact the webmaster.